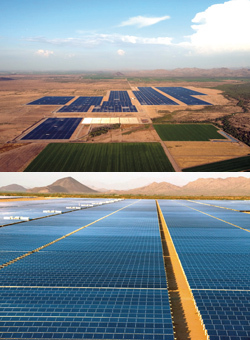 EPC provider Fluor Corporation organized the massive 125-MW AVSE II solar project in Arizona down to the smallestdetail, resulting in the project being completed a full month ahead of schedule. 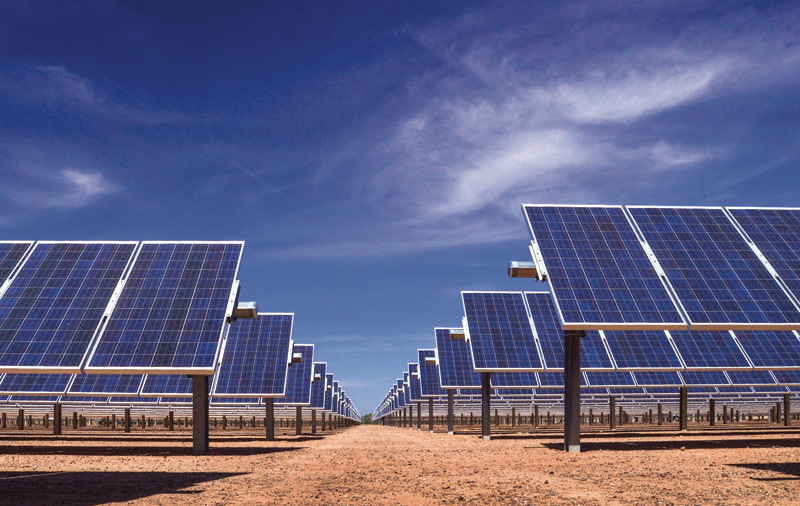 Before the first load of dirt was ever moved, global engineering company Fluor Corporation had already built a digital version of the 125-megawatt Arlington Valley Solar Energy (AVSE) II PV project in Arizona, with details down to every minute step. By completing extensive planning beforehand, the Irving, Texas-based company was able to finish one of the world's largest utility-scale PV projects about a month ahead of schedule, said Malla Reddy, Fluor vice-president, based in Aliso Viejo, California. "We work on large projects with our proprietary material management software that manages logistics from inception to the time that equipment is placed in service or stored on the site," Reddy said. "We develop a very detailed plan, and from the beginning, it's virtually built before it's moved to the site, and we know how it's going to be done." The result was a carefully orchestrated plan that included not only engineers and construction managers, but also Fluor's worldwide procurement division, which worked with the various vendors. Fluor provided engineering, procurement, construction, and commissioning services for the project owned by New York-based LS Power and situated about 50 miles west of Phoenix. Key to the project's success was Fluor's entrenched safety philosophy. "Fluor's safety record is much better than the construction industry average," Reddy said. "We take a lot of pride in keeping all of our workers safe." Fluor's safety team helped oversee efforts that filter down to every employee, he said. With the AVSE II project, safety also included ensuring workers were properly hydrated during summer months, when temperatures routinely topped 110 degrees Fahrenheit, he said. The project's owner, LS Power, negotiated a 25-year power purchase agreement with San Diego Gas & Electric (a Sempra Energy company) in July 2011 for all of the output from the 125-MW project. About the same time, SDG&E also inked a PPA with San Diego-based enXco for up to 110 MW from the Kern County, California, Catalina Solar project. The two totaled 235 MW of solar power. Such long-term agreements are typically required before large solar-power plants can be financed and built. Services unit participated in the project as an equity partner. With financing completed, LS Power authorized construction of the project in February 2012.
requirement regarding where the project is physically located, said Jennifer Ramp, SDG&E senior communications manager. "This project, like all others, went through a competitive solicitation process, and deliveries matched our need and the price was competitive," she said. Ramp added that SDG&E has also signed 10 contracts for solar and wind power in California's Imperial Valley over the past few years, equivalent to more than 1,000 MW of green power. The AVSE II plant connects to the power grid at the substation where SDG&E's Southwest Powerlink transmission line begins. "If you want a future in energy, you have to connect to Arizona," says Jim Avery, SDG&E senior vice president of power supply. He added that the utility has also signed a long-term contract to purchase up to 130 MW of power from the Centinela solar plant under construction in Imperial Valley, California. LS Power has plans for a second phase of the same size at Arlington, which technically will be called the Arlington Valley Solar Energy I. But it has not yet secured a long-term PPA for that site. The project would be partially built on state land. Power from AVSE II will go toward helping SDG&E meet the California Renewable Portfolio Standard, which requires public utilities to obtain at least 33 percent of the energy they deliver to consumers from renewable sources by 2030. For 2012, the San Diego-based utility obtained 19.2 percent of its power from renewable sources. Of that, solar comprised 3.4 percent, according to figures from SDG&E. For 2013, renewable energy comprised 23 percent of the power delivered to SDG&E customers, and the utility plans to meet the 33 percent Renewable Portfolio Standard by 2020, Ramp said. Preparation of the 1,160-acre AVSE II site was minimal, although Fluor had to develop a plan to manage runoff including installation of drainage systems and rainwater retention ponds, Reddy said. Fluor was responsible for ensuring individual suppliers met its delivery schedule. "Most of the deliveries were from in and around Phoenix, so it made sense to do it at night," he said, referring to Phoenix's heavy day-time traffic. Because of the project's size and tight completion time frame, Reddy said the company went with two different panel suppliers: Japanese electronics firm Kyocera Corp and South Korea's Hyundai Solar. The 245-watt and 315-watt Kyocera modules were manufactured in its San Diego production facility. "It gives us the advantage of maintaining the schedule and the logistics," Reddy said of the two suppliers. "It gave us the flexibility, and the client also was with us in making all of these decisions." LS Power made the decision to go with single-axis tracking for this project. "I think it's the capital cost versus efficiency," Reddy said. A life-cycle analysis of this site showed that a single-axis system could deliver a 10 percent to 20 percent savings on life-cycle costs, but the actual savings depends on location. "That's the reason why in some locations it makes sense, and in some of the financing conditions, the financing drives the decision also," Reddy said. "The single-axis tracking came out to be a better technology for this project." Albuquerque, N.M.-based Array Technologies Inc. supplied its DuraTrack HZ solar-tracking system. The trackers were commissioned one block at a time. The first block was commissioned in August 2013. In this case, the DuraTrack system was chosen because it generates more power than a traditional fixed-mount system. It's also engineered for reliability with a minimum amount of materials. The project was divided into five array blocks for logistics management. As each one was completed, it was commissioned, brought online, and turned over to the client. "So we turned it over to the client block by block," Reddy said. The first 19-MW block was commissioned in May 2013, and the project was completed in October 2013. Fluor performed much of the construction, including the installation of more than 1,000 miles of wire and cable. Crews started in the first section driving pilings. Altogether 135,000 pilings were involved. Following the pier installation, the trackers were mounted on the piers. The modules were installed one by one on the trackers. In all, more than 600,000 modules were involved in the project. Next to each block was a small space where panels could be pre-assembled. As the crew moved to the next section, another group moved in behind to mount the panels onto the pilings, followed by a wiring crew that hooked up the panels in series. Much of the workforce was hired locally. "They came in with different levels of experience," Reddy said. "The overall productivity picked up speed as the workforce came up on the learning curve through training and on-the-job experience." Hassayampa 500kV switchyard and the electric transmission grid. Pike Corp. Inc., of Mont Airy, N.C., performed the high-voltage electrical work. To monitor and control the plant systems, including trackers, inverters, and substations, Fluor contracted with Zurich, Switzerland-based ABB (Asea Brown Boveri Ltd.) for a Symphony Plus plant automation system. As mentioned, safety was a high priority. Each day before work started, workers received safety training and reviewed the tasks to be done. "We start every meeting, whatever type of meeting it is, with a safety topic to build awareness and keep that awareness in front of employees," Reddy said. "Every site has different quirks. At this site, we found out people weren't hydrating even though we emphasized it every day." 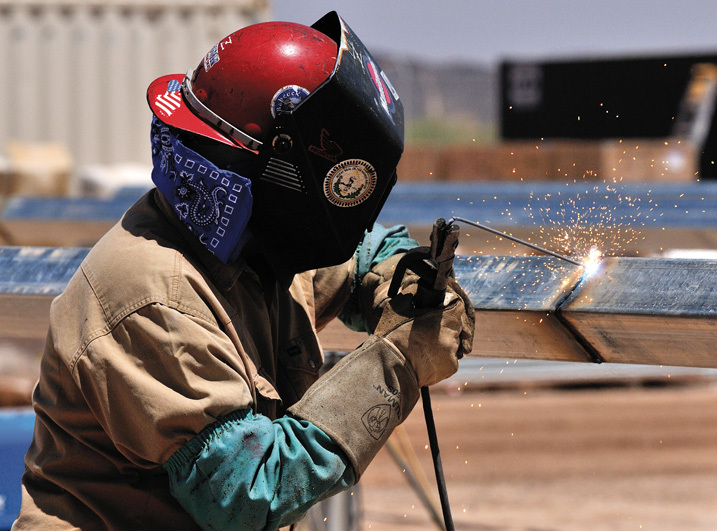 Fluor implemented a buddy system where workers looked after one another as far as hydration. Although that helped, Reddy said supervisors also counted water bottles to monitor the amount of water consumed. The two procedures together helped to ensure workers stayed properly hydrated. Because the construction site was open with no trees, Fluor also provided portable shade structures with fans. Workers could go there on breaks to cool down and rest. 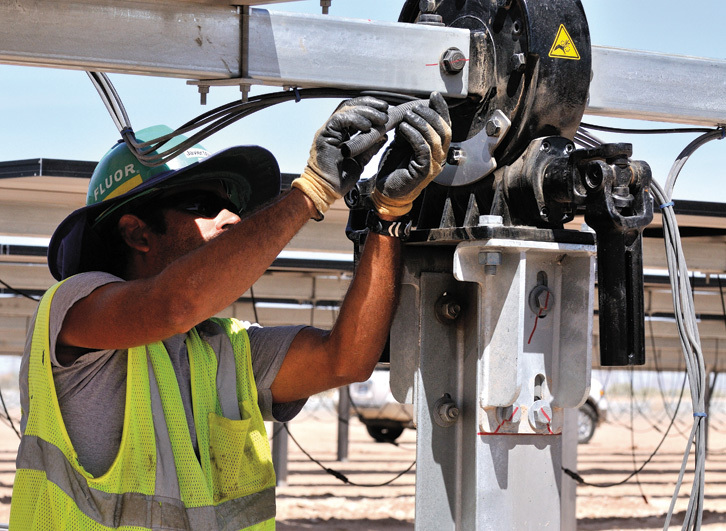 The systems worked so well at keeping workers safe in the heat that the company is now using them on the 170-MW Centinela Solar Energy Project being constructed in the Imperial Valley, Reddy said. The Imperial Valley, located along the California-Mexico border, has temperatures similar to Phoenix. Today, the AVSE II project stands as one of the largest solar projects in the U.S.-it is the size of approximately 516 football fields-and its 125 MW, are contributing in a significant way to meeting the region's needs for clean, renewable energy.